Oregon: The Ducks have five different jerseys (green, white #1, white #2, black, and yellow), four helmets (green, white, black, and carbon fiber), and three sets of pants (green, white, and black), not counting their throwbacks. They are known for their mix-and-match combinations to the point that there is a website that tracks their weekly uniform combinations. The Ducks have two different white jerseys (one with green numbers, the other with silver), but both are designed to be worn on the road. The team's three colored jerseys (green, black, yellow), as well as the throwbacks (kelly green), are worn at home. Louisiana State: The Tigers consistently wear white at home. In fact, it's rare to see the team in its purple jerseys, although there is usually a team (I'm looking in your direction, Mississippi State.) that usually wears white at home for a week just to mess with the Tigers. This begs the question: What happens if Virginia Tech (a Pro Combat school) or perhaps Clemson decides to wear white at home? Will Georgia Tech have to scramble back to Russell Athletic for new alternate jerseys? Will they just wear white anyways and forfeit a timeout like USC did when wearing red while visiting crosstown rival UCLA (who wore light blue) in 2008? There is a major competitive issue regarding how teams could exploit the Georgia Tech uniforms. Theoretically, Tech could be forced to play all of its conference road games (The NCAA requires teams to agree on a home team wanting to wear white, but in-conference games are governign by the conference in this case.) with only two timeouts in the first half. Who's to say a team like VT, Clemson, or even Georgia wouldn't want or need to use this type of tactic for a shot at a bowl game? The NCAA isn't the only sport in which teams opt to wear white at home. The NFL has a few teams, most notably the Cowboys and Redskins, who consistently wear white at home. The Redskins are rumored to have started the trend to mess with the Cowboys, and they apparently aren't the only team to employ the tactic. The Eagles and Panthers have worn white just to mess with Dallas, and they have had some success in it. There are also a few teams, such as the Buccaneers, Dolphins, and Jaguars, who have went with white at home because they believe it helps them "beat the heat". The Siants wore white at home during parts of the 2008 and 2009 seasons just because they wanted to. And in a twist of events that could only involve Al Davis, the Raiders wore white at home in 2008 against the Chargers at the behest of then-coach Lane Kiffin, who wanted to stick it to the Raiders' eccentric owner. In MLB, every team has at least one white uniform, while some teams have two, and others use off-white. And the NHL, a staple in the white-at-home landscape for many years, switched their policy after the lockout to have the home team in a colored jersey, while the away team is relegated to the white sweaters. The NBA has the "white-at-home" rule, but has relaxed it a bit. The Cavs wore multiple different colored jerseys at home over the past couple years, from throwbacks to CavFanatic promotions. And the Pistons have worn their red alternates at home a few times. San Antonio used a silver uniform as a home alternate before they were outlawed, while the Lakers were grandfathered into the NBA's white-at-home rule and wear their yellow uniforms as their primary home set, with the white only being worn at home on Sundays and for special occasions. Personally, I would like to see the NBA go to a system in which the home team wears their colored jerseys. With the advent of alternate uniforms and throwbacks, teams could use the opportunity to wear color at home as a merchandising tool, similar to what the Cavs have done the previous couple years. The Lakers wouldn't have to be grandfathered in to a new rule, and could wear their white jerseys more often, while the purple sets could become the alternates. Fans would get to see their teams' alternate uniforms (like the Suns' orange, the Bucks' red, or the Mavs' royal blue) in person, and not just on TV. As a general rule, the dark jerseys sell more than the whites (unless the team in question wears a color like purple, which isn't terribly popular among most fans). Teams could use that trend to market their primary dark jerseys, as well as their alternates, using the idea to actually "wear what the players are wearing" while having the entire arena blanketed in a sea of color, from the court and the fans, to the players. This week's Double-Play Design features one of the greatest rivalries in sports. 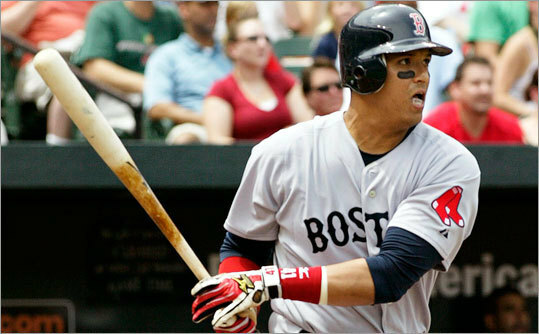 The Boston Red Sox and the New York Yankees. 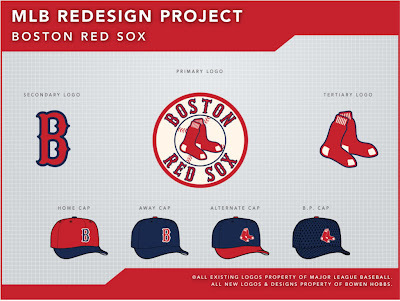 Starting with the Sawx, I had two main objectives: 1) To make the Red Sox the "Red Sox", and 2) to give the team's identity an essence of vintage baseball, thus showing respect to the team's rich tradition. Objective #1 was easy to figure out, while #2 forced me to look into Boston's baseball past. I found that the current typeface is a modernized version of their original font, so I reverted back to the original version, which is more legible and consistent. I also changed the team's white to off-white, giving the identity an affinity for yesteryear. I kept the cap logo the same, but with the slightly modified typeface, and I added a navy stroke to the tertiary logo to avoid this issue (look at his right sleeve). The uniforms use a piping style from the team's history, as seen in this Norman Rockwell painting, and the socks patch is moved to the right sleeve, so it no longer looks like it is running away from its opponents. The home sets focus on red as the primary color, using red caps to accent the red type and trim on the off-white uniforms. The home alternate is a red jersey with navy type, matching the home cap. Boston's current away uniforms look more like Yankees knockoffs than Red Sox uniforms. 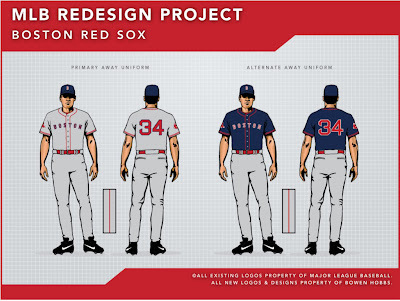 Although they share the style of the 1986 aways, what Red Sox fan would want to be reminded of Bill Buckner? In my concept, I returned the aways to using red type, which sits on a grey base. 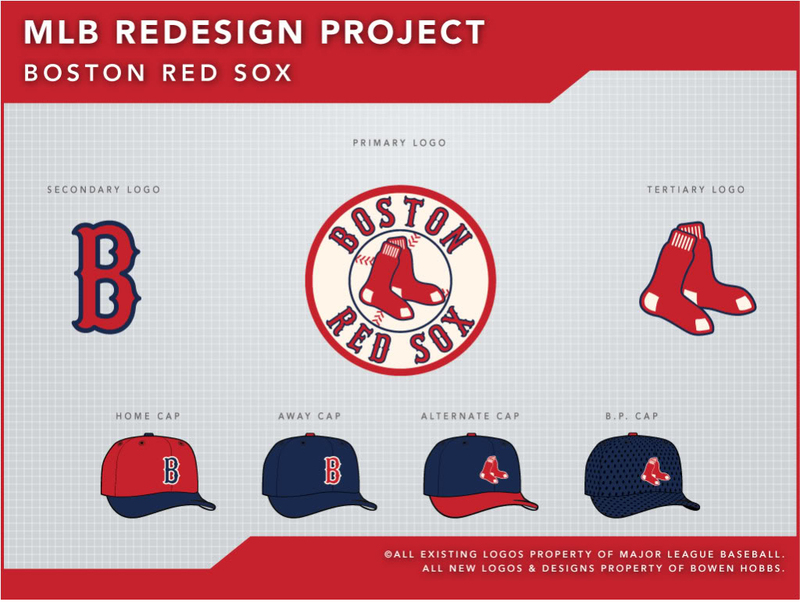 I used an all-navy cap for the road sets, allowing the Red Sox to reclaim this look to a certain extent. The away alternate jersey once again matches the look of the cap, this time as a navy jersey with red type. The Sunday Alternate uses the socks logo as a chest patch and is paired with a navy cap that features the socks logo and a red brim. Next up are the New York Yankees. My main issue with the current Yankees identity is consistency. The Evil Empire uses two different NY logos on the hats and jerseys. And the Bronx Bombers' current primary logo is royal and red, while the team only wears navy and grey on its uniforms. So with those issues in mind, I changed the primary logo to navy and grey, and decided to keep the cap NY while eliminating the others, as they are superfluous. 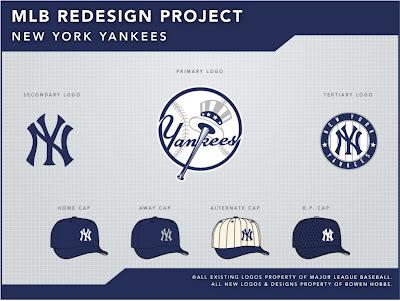 I also developed a tertiary logo that plays off the idea of the Yankees' being known for their signature pinstripes, which are the background within a navy circle containing the NY logo. As for the Pinstripes' uniforms, I refuse to believe that they are too classic, and changing them would be blasphemy. I do understand the logic of preserving the primary home uniform, but I took the opportunity to use the cap NY on the jerseys, thus unifying (and improving) one of the greatest uniforms in sports history. The home alternate is a navy jersey with the NY logo on the chest in white. 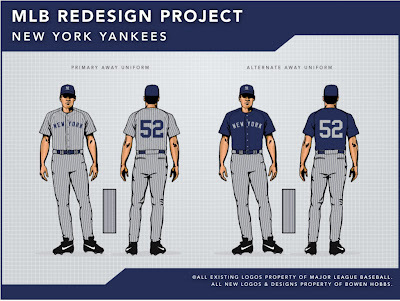 The Yankees' current away uniforms are nothing special and have not changed since the 1970s. They are actually very similar to the current White Sox road uniforms. In this situation, I decided to have the Yankees resemble their nickname and wear pinstripes. The aways start with a slightly darker grey base than the standard Cool Base grey and feature NEW YORK in block letters. 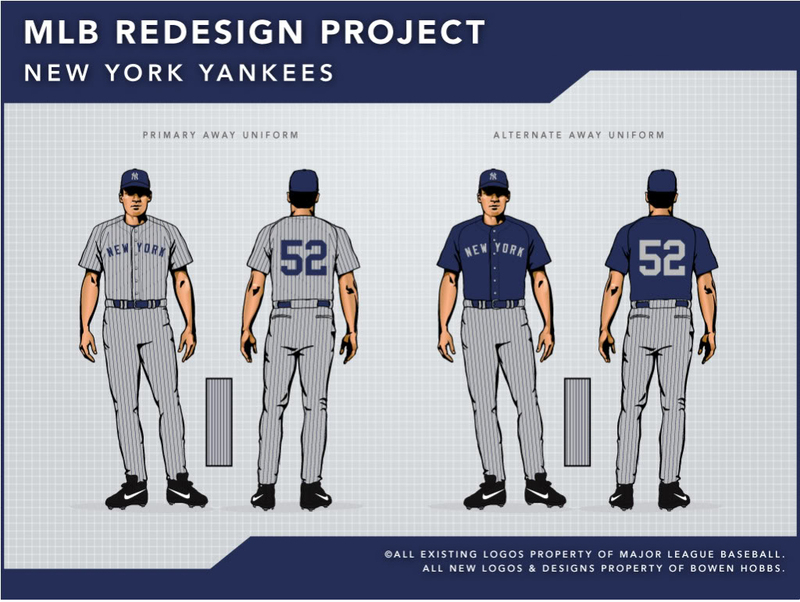 They are paired with a navy cap that uses the NY logo in grey, creating a simplified look that doesn't unnecessarily contain white. The away alternate follows this trend of simplicity by using grey type on a solid navy jersey. The Sunday Alternate provides a unique take Yankees' history. Starting with a cream-colored base I developed a pinstriped cream-colored cap with navy pinstripes and a navy bill. The jerseys are blank on the front but have the tertiary logo as a patch on the left sleeve, providing the team with an alternate uniform that pays tribute to the past, and fits with their storied history. Feel free to comment on Georgia Tech's all-white campaign, the use of white vs. colored jerseys in sports, or the Red Sox and Yankees concept above. 44º North Advertising & Design is an advertising firm located in downtown Oshkosh, WI. Our sister company, Encoré Event Planning can create your event from conception through completion.